The key to a successful event is to get people talking about it before it even happens. Orchestrating a good buzz for the venue, conference, gala, or whatever type of event you are hosting will increase ticket sales and attendance while also helping you anticipate the success. But where do you start? Put a hashtag on it. Social media is your first stop when it comes to getting people to talk about your event. Create an event page on Facebook and LinkedIn, then promote on your own Instagram and Twitter accounts. 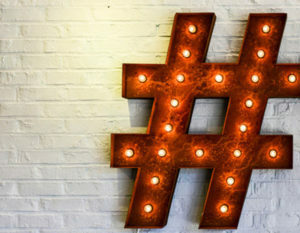 You will also want to create an event-specific hashtag and include it on any social media promotion, including graphics. This is where your team will come in handy, too. Assign specific tasks to your marketing team so that a strategy can be implemented. For example, acknowledge any posts or comments that are made in relation to the event. Someone should be responsible for monitoring feedback and questions. The better customer service you display on social media, the more interested those who see it will be in attending your event. The beauty of social media advertising is that you can narrow down your ads to reach those who may be interested in your event and reduce wasted advertising money. Choose a manageable budget that can be increased as you get closer to the event if need be. Social media advertising should be done at least two months before ticket sales end, or, if tickets will be available at the door, two months before the event itself. It can start up to six months beforehand, but if you start any earlier than that, you can lose interest before the event happens. Create ads that are engaging, aesthetically pleasing, and information rich. If your ads are confusing or annoying, you will lose your audience. Never underestimate the power of advertising locally. Use public relations tools to reach out to local news outlets about featuring your event and company about two weeks before the event or before ticket sales end. Make sure your website and social media URLs are included in the article and request that the article be posted on their website as well. Call your local news station and ask for coverage on the event, too. Putting up posters in your local coffee shops, event centers, and libraries is also an effective way to get your name and event out in front of people. The more places people see the information, the better. If you have regular attendees to your events, you may consider sending out formal invites to your high profile and most-likely-to-attend clients. A personal touch, such as a signature from the CEO, can be the cherry on top that leaves them showcasing their invite to friends, which then increases that buzz. People are also more likely to attend the event if they get a personal invite than if they were to just see an ad. The venue you choose for your event will set the tone for the buzz. Choosing seasonally and fashionably appropriate colors makes the photography for the event pop and draws people in. Have an area where people can take photos with props for their social media, which will encourage attendees to post in real time as well as go LIVE using Facebook or Instagram. Even if your event requires tickets that are bought ahead of time, creating a large buzz about how beautiful and fun your event is this year makes your job easier for next year! Choosing an event space with working WiFi and a strong signal will increase your buzz because then your guests can post in real time! Above all, do not try to plan a large event last minute because, done properly, it would really need roughly six to eight months to plan. The less time you give yourself, the more likely it is that something will get neglected and that the chances of the event being a success will decrease. Remember to put care, excitement, and positivity in all your advertisements and posts, and you will find yourself trending where it matters.